Lee Woolery | Troy Daily News Troy linebacker Shane Shoop (23) makes a stop against Turpin Friday at Troy Memorial Stadium. Lee Woolery | Troy Daily News Troy’s Spencer Klopfenstein (84) and Weston Smith (25) combine for a tackle against Turpin Friday at Troy Memorial Stadium. 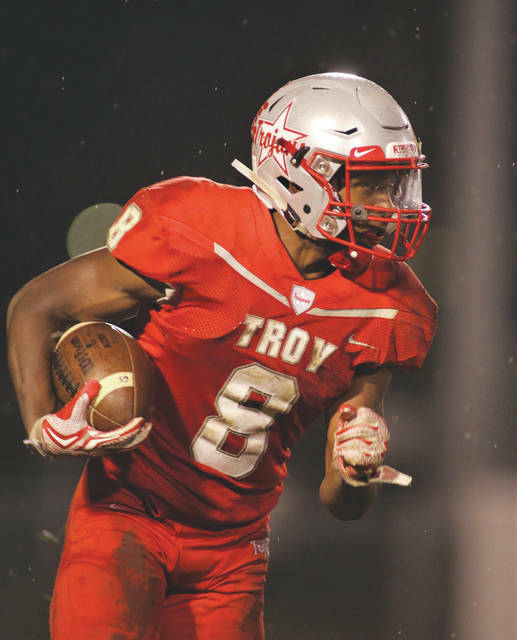 Lee Woolery | Troy Daily News Troy running back Jaydon Culp-Bishop breaks free against Turpin Friday at Troy Memorial Stadium. TROY —Shane and Jacob Shoop are twin brothers playing for the Troy football team. It’s a good thing for the opposition they aren’t triplets. The Shoop brothers may not stand very tall, but both came up huge on both sides of the ball Friday at Troy Memorial Stadium in the Trojans’ 29-7 win over Cincinnati Turpin. Jacob, playing free safety and wide receiver, finished the game with three tackles and led the team with two pass break-ups. He also had one catch for 34 yards. On the second play of the third quarter, he pulled in a pass from Brayden Siler for what looked to be about a 10-yard gain, but then broke three tackles to turn it into a play that helped set up a 12-yard touchdown pass to his twin brother. Shane had two catches for 26 yards, including the 12-yard touchdown pass that put the Trojans up 22-7 early in the second half. He had an even bigger presence at inside linebacker, however, as he finished the game with 12 tackles — including 10 solo stops — two tackles for loss and a quarterback hurry. A pair of back-to-back plays by Shane late in the third quarter helped ice the game for the Trojans. With Turpin trailing 22-7, the Spartans faced third-and-1 at the Trojan 34, looking to pull within one score. Turpin running back Reece Evans got the ball on a run up the middle, but was met in the backfield for a 1-yard loss. On fourth-and-2, the Spartans tried a similar play to Evans, but he again was stuck in the backfield by Shoop for a 1-yard loss, forcing a turnover on downs. After Troy took over on downs, the Trojans went 64 yards in just five plays, scoring on a 23-yard touchdown run by Jaydon Culp-Bishop to go up 29-7 and essentially put the game out of reach. Troy linebackers coach Jason Manson had a few simple words for his players before Friday night’s game. “I told them, ‘Don’t ruin this for me,’ ” Manson said with a laugh. Manson — a two-time All-Ohio player for the Trojans in the mid-1990s — was one of five people who will be inducted into the Troy Athletic Hall of Fame this weekend. The five — Manson, Hildred Byrkett, Vickie Felver, Dan Cox and Todd Denlinger — were introduced before Friday’s game. Incredibly, this was the sixth time a Troy Athletic Hall of Fame class was introduced, but it was the first time the Trojans were able to win a football game that same night. In 2016, Troy did beat Trotwood to open the season, but that game was suspended at halftime by lightning and finished up the next morning. Friday’s game against Turpin marked the first time in which Troy won a game with the hall of fame inductees still in attendance. Culp-Bishop and fellow senior Spencer Klopfenstein began the season seeing plenty of double duty. Culp-Bishop was seeing playing time at both running back and strong safety, while Klopfenstein was playing tight end and outside linebacker. 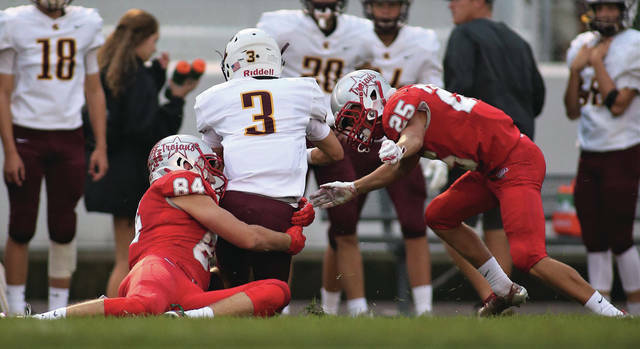 The emergence of two players players on defense — senior outside linebacker Zach Colett and senior safety Jacob Adams — has helped lighten the load considerably for Culp-Bishop and Klopfenstein. While Klopfenstein did still see time on defense — he finished the game with five tackles — he saw less time there than he did the first two weeks of the season. That allowed him spend more time on offense, where he led the Trojans with four catches for 65 yards — including a spectacular diving catch — and, as always, was a key component in the blocking game. He split time with Collett, who finished the night with five tackles. Culp-Bishop saw no time on defense, which allowed him to finish the game at running back with 37 carries for 238 yards and two touchdowns, to go along with a 75-yard return for a touchdown on a free kick following a Turpin safety. Adams — who missed all of last season with an injury — finished the game with seven tackles. With only three games as the starting quarterback under his belt, junior Brayden Siler is looking more comfortable with each passing week. One week after throwing for 163 yards against Xenia, Siler was incredibly efficient and accurate against Turpin, completing 10-of-14 passes for 149 yards with one touchdown and no interceptions. He completed at least one pass to six difference receivers. Through three games, he has completed 26-of-43 passes (60.5 percent) for 399 yards, with three touchdowns and three interceptions. He also has a pair of rushing touchdowns. Defensive linemen Adam DeCerbo and Austan Good combined to hurry Turpin quarterback Justin Silverstein into the intentional grounding penalty that led to the safety. Junior cornerback Weston Smith recorded his first-career interceptions. For the season, Culp-Bishop now has 71 carries for 494 yards and six touchdowns. 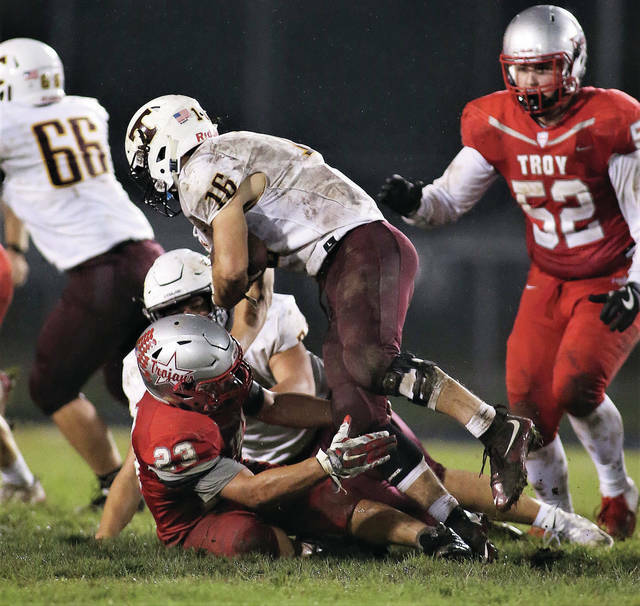 https://www.tdn-net.com/wp-content/uploads/sites/21/2018/09/web1_shaneshoop-1.jpgLee Woolery | Troy Daily News Troy linebacker Shane Shoop (23) makes a stop against Turpin Friday at Troy Memorial Stadium. https://www.tdn-net.com/wp-content/uploads/sites/21/2018/09/web1_2-KLORFENSTEIN-AND-WESTON-SMITH-MAKE-STOP-1.jpgLee Woolery | Troy Daily News Troy’s Spencer Klopfenstein (84) and Weston Smith (25) combine for a tackle against Turpin Friday at Troy Memorial Stadium. https://www.tdn-net.com/wp-content/uploads/sites/21/2018/09/web1_2-CULP-BISHOP-BREAKS-FREE-1.jpgLee Woolery | Troy Daily News Troy running back Jaydon Culp-Bishop breaks free against Turpin Friday at Troy Memorial Stadium.